And maybe take home a new eagle license plate! 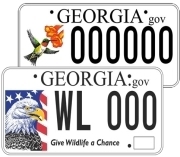 How much do you know about the changes this year for Georgia’s wildlife license plates? That’s what we want to know. And to help find out, we’re giving away a bald eagle plate! What do you need to do? That part is easy. Just take this brief survey before Thursday, Oct. 2. Then watch your inbox. If you’re the winner, we’ll email you the good news by Oct. 6. 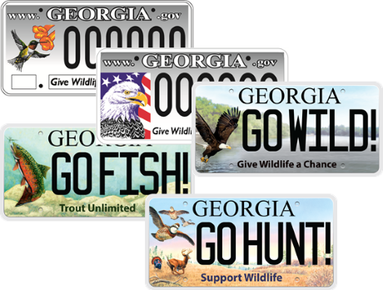 Oh ... and if you don't win this time, don't miss the upcoming issues of Georgia Wild. We’ll give readers another chance to win an eagle tag this fall! Take the survey. Only one entry per person. Eastern hellbenders are super-secretive – active mostly at night, living under submerged rocks, camouflaged so subtly that even by day these giant salamanders, the largest in North America, disappear into the cobbled beds of the cold mountain streams they inhabit. All of which makes the recent video of a hellbender guarding a “nest rock” even more amazing. Wildlife biologist Thomas Floyd of DNR’s Nongame Conservation Section and Dr. Shem Unger, a postdoctoral researcher at UGA's Savannah River Ecology Laboratory, were looking for larval hellbenders Sept. 5 as part of a State Wildlife Grants project exploring the impact of sedimentation levels on young salamanders. But in the bend of a rain-swollen creek on the Chattahoochee National Forest, the snorkelers saw the head of an adult male hellbender protruding from a gap in the rocks. The scientists watched, fascinated, as the male defended the site against male and female hellbenders trying to get in. The male even bit a large female. Undeterred, she slipped past him. Possibly drawn by pheromones and maybe by habit – hellbenders can live more than 50 years and “who knows how long these particular hellbenders have been doing this skit,” Floyd said – the females were trying to enter the nest to deposit eggs. Out of sight, the den master would externally fertilize the clusters, much like native trout in north Georgia streams do. The other males also had reproduction in mind. Adding their milt could extend their family line. Unger said that while little is known about the breeding biology of hellbenders in the wild, genetic research conducted in another state recently confirmed multiple parentage of a nest guarded by a single male. It has been widely believed that only one male and one female contributed to each nest. The genetic evidence, however, suggests the story is more complex. Either multiple females enter and deposit eggs in the same guarded nest, or multiple males, possibly smaller “sneaker males,” help fertilize eggs in that nest – behavior common in other amphibians. 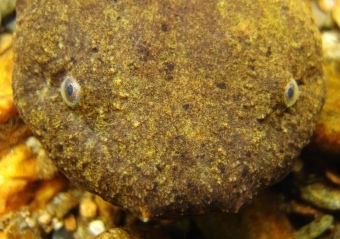 Although multiple paternity has not been confirmed in hellbenders, “the entry of multiple males under a single nest rock suggests this,” Unger said. The den master will guard the eggs “through hatching until the larvae are ready to leave the nest, probably into March,” Floyd said. Considering that habitat loss has hellbenders on the decline, den masters and the nests they guard are critical to the species, and part of a seldom-seen aquatic “skit” that can now be watched by all. It’s not clear why this den master nipped the large female trying to enter the nest site. Floyd’s theory is that maybe female suitors are not quickly discerned from male intruders, and the den master’s guard helps ensure that only the strongest or smartest mates make it into the nest. During late summer, males begin excavating saucer-shaped depressions under flat rocks. Suitable nest rocks have a sizable cavity underneath and few entrances. Dominant males defend these sites. Females attracted or lured to the nest deposit from 450 to nearly 1,100 eggs in a single compact cluster, with the eggs strung together, similar in appearance to a pearl necklace. Occasionally, several females will oviposit in the same nest. Following external fertilization of the eggs, the male guards the clutch from predators until hatchlings disperse from the nest rock. 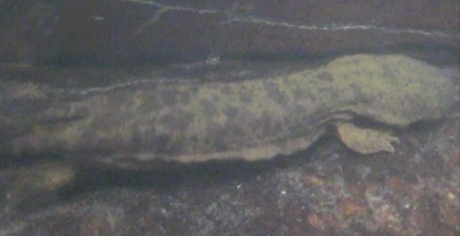 In Georgia, hellbender breeding season lasts from about mid-August to late October. Repeatedly disturbing habitat by flipping or moving rocks in streams is detrimental. DNR surveys a stream for hellbenders only once every several years and never in breeding season. 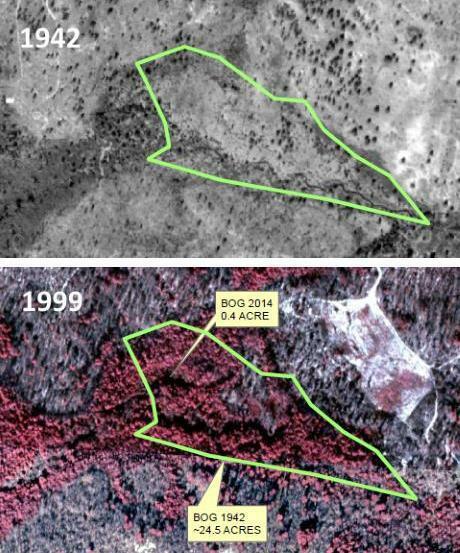 The aerial images are revealing: A bog on Fall Line Sandhills Wildlife Management Area that covered more than 24 acres in 1942 had shrunk to smaller than an acre by 1999. It’s not a sea change for this part of the upper Coastal Plain, which marked the edge of the Atlantic Ocean eons before. But the images provided by the Nongame Conservation Section’s Chris Canalos show how significantly the wetland has changed, and how far efforts to restore it might reach. Nongame senior wildlife biologist Nathan Klaus said what’s left of the natural community in this “tiniest scrap of a bog” is still rich in species, such as sweet pitcherplant and tawny cottongrass. This year, the bog produced the first southern coal skink documented in Georgia since 1975 (Georgia Wild, May 23). Yet populations of rare plants are thin, including fewer than 20 individuals of tawny cotton grass. What happened? Largely because fires that historically swept the area have been suppressed, the bog yielded to an onslaught of shrubs and trees. The 1942 image shows no shrub transition zone between upland sandhills and wetland. Klaus said you have to fight through acres of shrubs to reach the bog now. Usually formed at spring-heads and on seepage slopes, bogs in the Southeast’s Coastal Plain region often contain unique communities of plants and animals. But many of these bogs have been lost to lack of fire, development and changes in hydrology, such as draining and building ponds and reservoirs. The bog on Fall Line Sandhills’ West Tract is one of the hillside seepage bogs that dot the WMA near Butler. Nongame staff hand-cleared some of the site last year. The long-term plan is to restore the full 24-plus acres. The effort will involve applying prescribed fire and planting tawny cottongrass, propagated for safekeeping by Atlanta Botanical Garden. As a road map for restoration, Klaus and others need only look to a 72-year-old aerial photograph. Georgia aster, a rare wildlife found in parts of Georgia, Alabama and the Carolinas, does not require protection under the federal Endangered Species Act. The recent announcement by the U.S. Fish and Wildlife Service follows an in-depth review of the plant – a candidate for federal listing since 1999 – and reflects the commitment made this spring by DNR and eight other partners to conserve Georgia aster. A Conservation Field Day for landowners, land managers and resource professionals is set for 9 a.m.-3 p.m. Thursday, Oct. 2, at the Georgia Power recreation area in Burke County. Topics at the event, sponsored in part by the National Wild Turkey Federation and Georgia Power, vary from creating pine savannah habitat for wildlife to blending timber production and gopher tortoise conservation. Registration has been extended, but sign up soon; $10 for open registration, $30 for CFE (continuing forestry education) and CLE (continuing logger education) credits. Contact. If hummingbirds are mobbing your feeders, binging for migration, you can report sightings and track the wave of hummers moving south through Journey North. This free, Internet-based program by the Annenberg Foundation offers young and old a fun, informative way to explore hummingbird migration, in the fall and spring. What’s cuter than a gopher tortoise hatchling? Not much. 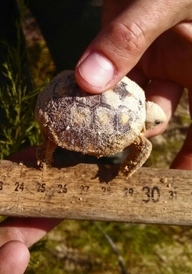 The Nongame Conservation Section’s tortoise survey crew found this newly hatched tortoise Sept. 10 on Brantley County property owned by The Nature Conservancy. Georgia State Parks’ Leaf Watch website will begin posting regular updates next month, helping leaf peepers find the best fall color in north Georgia. Leaf Watch includes top trails and overlooks, mountain cabins and campsites, fall events, and safe hiking tips. Names in the news: The recently named members of a national Blue Ribbon Panel on Sustaining America’s Diverse Fish and Wildlife Resources are, as expected, a Who’s Who of conservation heavyweights, including John Fitzpatrick, Cornell Lab of Ornithology director and eBird co-inventor, and Jennifer Mull, CEO of Backwoods Equipment and Outdoor Industry Association board chair. The panel, chaired by Bass Pro Shops founder and CEO Johnny Morris and former Wyoming Gov. Dave Freudenthal, are charged with providing recommendations and policy options for the most sustainable and equitable model to fund conservation of all fish and wildlife species. Mark Melvin of the Joseph W. Jones Ecological Research Center at Ichauway will again chair the Georgia Prescribed Fire Council. Melvin, who served as the group’s original chairman, was elected chair-elect last week and, with the term of office set at one year, will replace Shan Cammack of the Nongame Conservation Section next September. A memorial celebrating the life of noted Alabama birder Bob Sargent is set for Oct. 25 in Trussville, Ala. Sargent, founder with his wife Martha of the nonprofit Hummer Bird Study Group, died Sept. 7 at the age of 77. Correction: DNR Nongame Conservation Section employee Hal Massie found the white-fringed orchid reported recently from the Black Creek tract of Fall Line Sandhills Wildlife Management Area (“Fire spurs rare orchid," Aug. 25). Oct. 2 – Conservation Field Day for landowners, managers and professionals, 9 a.m.-3 p.m., Georgia Power recreation area, Burke County. Email. 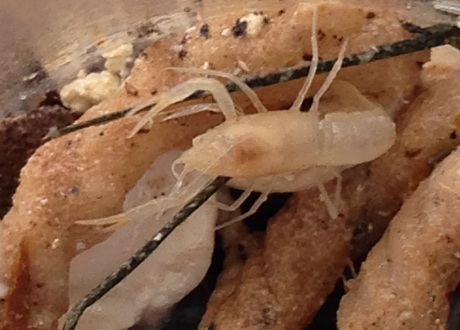 Two rare Dougherty Plain cave crayfish, one is pictured above, were caught in southwest Georgia last week by researchers with the San Antonio Zoo's Department of Conservation and Research, the Illinois Natural History Survey and the United States Geological Survey. Working under contract with Georgia DNR, the researchers used specially-designed traps in groundwater monitoring wells to catch the crayfish, one each in Miller and Early counties. 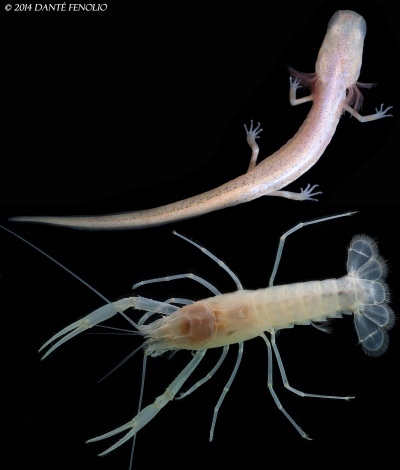 The innovative trapping technique targeting the Dougherty Plain cave crayfish and the Georgia blind salamander (both below), species petitioned for federal listing as threatened, provides a window into the nearly inaccessible, subterranean Floridan aquifer ecosystem. The catches on Sept. 25 – the first record of the crayfish in either county – marks a promising start to the trapping that will span much of southwest Georgia and hopefully provide needed information on the distribution and status of these two poorly known species.